It was a nervous Roger Goodell that ended the owners’ meeting. Note: NNR preview of the NBA season with David Kay will be up on https://fryingpansports.com/radio-show/ tonight after 10 PM. Tomorrow after Moo at 5 PM Samantha and I will preview the Browns Steelers game on our podcast. You could literally watch the beads of sweat form on the slightly challenged hair line of NFL Commissioner Roger Goodell as he addressed the media after the fall owners’ meeting. His voice was irregular and he sucked on his bottled water often. Goodell should be nervous. He has not been having a very good year. The Ray Rice debacle started his fall from grace. Then there was Tape-Gate. What everyone wanted to know was what did he know and when did he see the elevator tape. Then back to back came the Greg Hardy and Adrian Peterson issues. Instead of making a hard call on those problems, Goodell kicked the can down the street by putting both on double secret probation. By preventing them from playing while they go through the judicial process, Goodell has opened himself and the league up to more problems in the future. Even if they both are found guilty, the issue of double jeopardy will be brought up. The key to Goodell’s survival will be the Mueller report. If he is found to have seen the elevator tape before its general release by TMZ he is history. If the NFL office never got the tape, he is safe. Anything in between puts his job in the hands of the owners. 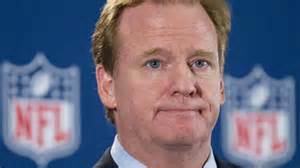 Don’t forget there are several new owners that do not have a long relationship with Goodell. A couple of others have been hit hard by recent Goodell decisions. The good is oft interred with their bones;” So let it be with Goodell.